Volkswagen Commercial Vehicles prepared several electrifying new models for the 2018 IAA Commercial Vehicles in Hannover (20 to 27 September). The main concept is the all-electric I.D. BUZZ CARGO. The I.D. BUZZ CARGO, of course, reminds us of the passenger I.D. BUZZ, but is designed for commercial purposes. It can take up to 800 kg of cargo and go over 550 km (342 miles) under WLTP cycle if fitted with the biggest 111 kWh battery. Handy is the electric socket (230 V, 16 A) for tools needed at work. The recommended battery size for the I.D. BUZZ CARGO by the manufacturer is 48 kWh and it would enable to DC fast charging of the vehicle to 80% in 15 minutes at 150 kW of power. Volkswagen experiments with various features in the concept - from cameras that replace mirrors, to a solar roof to wireless charging and level 4 autonomous driving. Hannover, 19 September 2018 – It is the most familiar of all transporters: the Bulli. Now, with the world premiere of the new I.D. 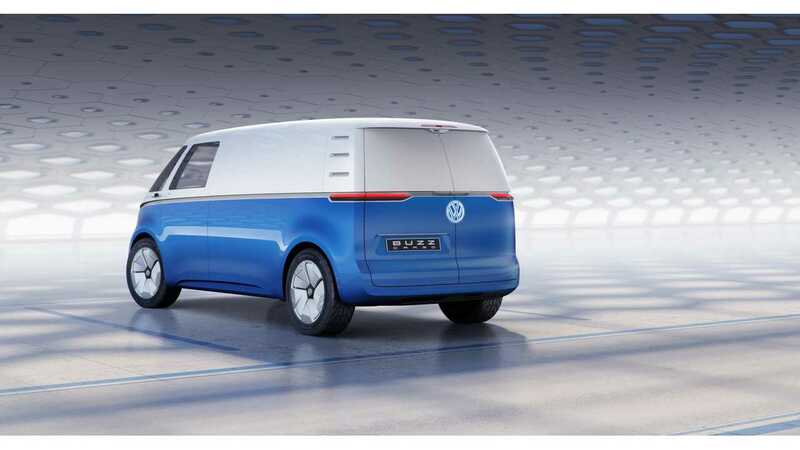 BUZZ CARGO, Volkswagen Commercial Vehicles is showing how an electrically powered and completely redeveloped Bulli might enrich the range of transporters. And as a supplementary model to the best-selling "T6". The most innovative zero-emission transporter of our time could be launched into the market as early as 2021. Meanwhile, the concept vehicle offers a glimpse into the middle of the next decade with its alternative, fully-automated "I.D. Pilot" driving mode (level 4). 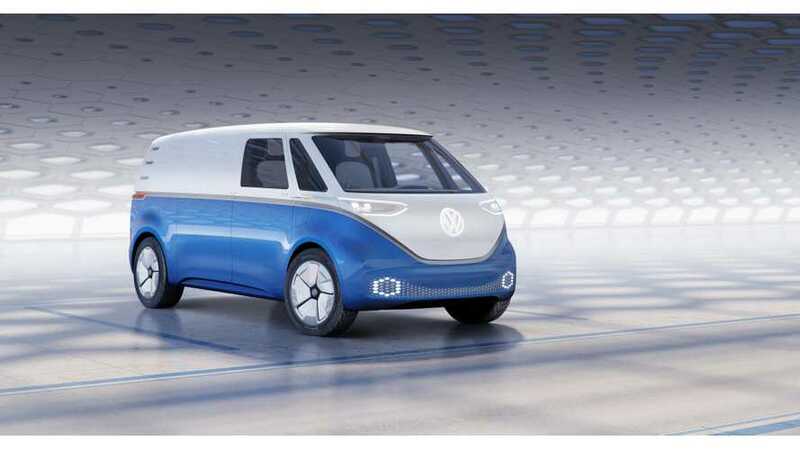 Era of electric mobility begins This concept vehicle shows how Volkswagen Commercial Vehicles is launching into the new era of electric mobility. Back in August, the company already presented the brand's first all-electric van with the world premiere of the new e-Crafter. While the e-Crafter launched as a panel van with an overall length of 5,986 mm and a maximum payload of 1.75 tonnes, the I.D. BUZZ CARGO concept is positioned in the size class beneath the Crafter. The payload (maximum load) of the concept vehicle is 800 kg; the I.D. BUZZ CARGO is 5,048 mm long, 1,976 mm wide and 1,963 mm tall. Its wheelbase measures 3,300 mm. By the way, the rear overhang was extended by 106 mm, making the cargo version of the I.D. BUZZ significantly longer than the van shown in Detroit. Transporter's exterior differs from that of the van Outside, the I.D. BUZZ CARGO concept is differentiated from the people carrying version by a new solar roof, wide-opening rear wing doors and a new rear bumper. With a view towards optimising utilisation of the cargo space with shelving systems, there is no sliding door on the driver’s side – and this is typical of transporters. The front doors and sliding door open electrically. Unlocking the vehicle from the outside is activated via a sensor solution. The I.D. BUZZ CARGO recognises authorised persons via a digital key which is sent to the van from a smartphone. Instead of the 22-inch wheels of the Detroit concept vehicle, new 20-inch wheels are used with size 235/55 tyres. With these specifications, the I.D. BUZZ CARGO meets the requirements of a utility-oriented transporter – but in this case with a progressive type of design. Interior with three seats in the front and computer workstation The interior has also been tailored for commercial use – down to the smallest detail. From the driver's cab to the rear, the I.D. BUZZ CARGO exhibits an entirely independent concept. Instead of two single seats, the concept vehicle is equipped with the driver's seat and a double bench-seat on the front passenger side – a typical commercial vehicle solution. The middle seat can be folded down. This opens up a workplace, at which the driver can take care of organisational matters via an integrated laptop. In the automated "I.D. Pilot" mode this can even be done on the move. The driver activates the autonomous mode at level 4 of the corresponding VDA classification (VDA = German Automotive Industry Association) by simply pushing on the steering wheel for a few seconds. It then retracts into the redesigned instrument panel. Thereafter the driver's seat can be turned 15 degrees to the right in order to enable the on-board computer to be operated from the ideal ergonomic position. "Internet of Things" will now be on-board in the cargo space The cargo compartment begins behind the first seat row and a bulkhead. Like the rest of the transporter, it was "re-thought". Volkswagen Commercial Vehicles is bringing the "Internet of Things" on board in this van. In cooperation with the German equipment specialist Sortimo, a new shelving system has been developed for the cargo area and fitted with sensors and a lighting system. This shelving system is connected to the intelligent I.D. BUZZ CARGO via a customer-specific function control unit and a CAN interface. The data is transferred by WLAN to tablets in the cargo space and cockpit. By means of a mobile radio network, the functional control unit might communicate with a company’s job or order management system, theoretically making it possible to track all articles on the shelves. This enables precise online management of the type and quantity of freight and equipment in the zero-emission Bulli. Further data is provided by the already available ConnectedVan fleet management system. High-volume space with a small turning circle Like all members of the I.D. Family, the I.D. BUZZ CARGO is characterised by an exceptionally large interior, with its innovative package enabled by the MEB. The battery is integrated into the vehicle floor, lowering the vehicle's centre of gravity and significantly improving handling. The transporter's axles have been shifted outwards, because no space is required for a combustion engine at the front, and the compact electric motor with its gearbox is mounted on the rear axle. This creates additional space (up to 0.2 m3) in the front of the concept vehicle. The electric motor drives the multilink rear axle. As an alternative, an electric all-wheel drive version with improved traction and performance can be implemented – as in the van. A rear axle steering system from the Detroit concept van was also adapted to the I.D. BUZZ CARGO; in conjunction with the large turn-in angle of the front wheels, this results in an extremely small turning circle of less than 10.0 metres – ideal for manoeuvring in the city. I.D. BUZZ CARGO as mobile workshop Driving up to loading ramps is made easier by the wide-opening, symmetrical rear wing doors. When the wing doors are opened, a workbench can be folded out. Even high-performance work tools can be supplied with power there from 230V electrical sockets (16A) via the battery. This has been implemented to ensure that the I.D. BUZZ CARGO is not just a means of transportation, but also a standalone mobile workshop. The zero-emission drive in detail The electric drive of the I.D. BUZZ CARGO consists mainly of the electric motor with power electronics and 1-speed gearbox integrated into the driven rear axle, the lithium-ion battery and auxiliary units integrated in the front body. The flow of high-voltage energy between the motor and the battery is controlled by the power electronics. Here, the direct current (DC) stored in the battery is converted into alternating current (AC). A DC/DC converter supplies the on-board electronics with 12 volts. As noted, it is possible to equip the I.D. BUZZ CARGO with different size batteries according to the vehicle's use profile. If the transporter covers fairly normal distances in the city on a daily and weekly basis, a lithium-ion battery with an energy capacity of 48 kWh is recommended. If greater range is needed, the energy capacity can be increased up to 111 kWh. The battery is generally charged overnight at a vehicle depot The high-voltage battery of the I.D. BUZZ CARGO is charged by cable connection. Using fast charging systems operating at 150 kW direct current, the 48-kWh battery can be charged to 80 per cent capacity in 15 minutes; for the largest battery expansion stage with an energy capacity of 111 kW it takes 30 minutes. As an alternative, the high-voltage battery can be charged from any conventional household socket, charging stations with a wide variety of power outputs or wallboxes. Although the Bulli can be charged at 2.3 kW via a normal 230V mains, Volkswagen Commercial Vehicles offers wallboxes that operate at much higher power levels up to 11 kW. They are especially advisable for charging batteries to 100 per cent at a company's vehicle depot overnight (when electricity prices are often lower). Design of a 21st century icon There is no other van in the world today with a design which is nearly as familiar, successful or unique as that of the Bulli. Over seven decades and six vehicle generations, Volkswagen Commercial Vehicles has refined and sharpened its design, continually reinventing it while never losing sight of the DNA of the model series. With the debuts of the I.D. BUZZ and I.D. BUZZ CARGO, the upcoming decade will see the advent of another series of all-round vehicles to supplement the "T6" – the Transporter, Caravelle, Multivan and California. This series will project the design of the original transporter into the future. It signifies a new, strong branch on the tree of an automotive icon.